Managing an Instagram account takes a lot of time and effort. 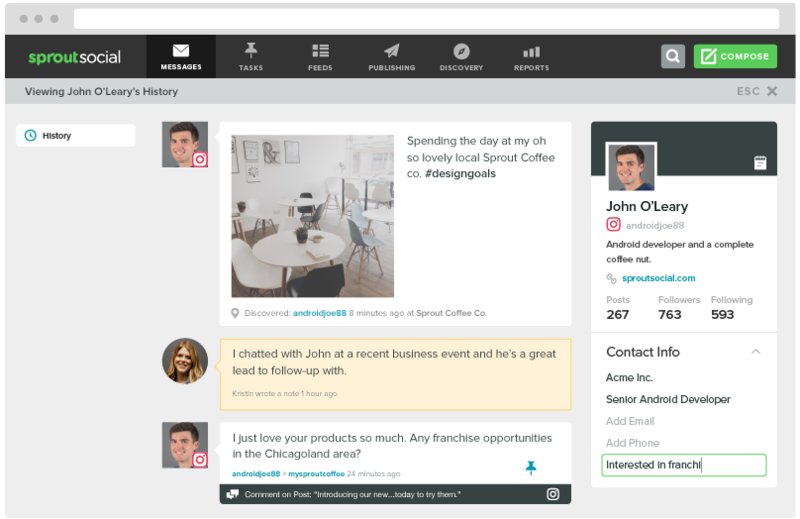 Replying to comments, posting new content, monitoring brand mentions and numerous other tasks fill up your day. As a result, several marketers look to Instagram automation to save time and take care of some of the more monotonous aspects of Instagram marketing. But here’s the problem–some brands go too far with automation to the point where it does more harm than good. 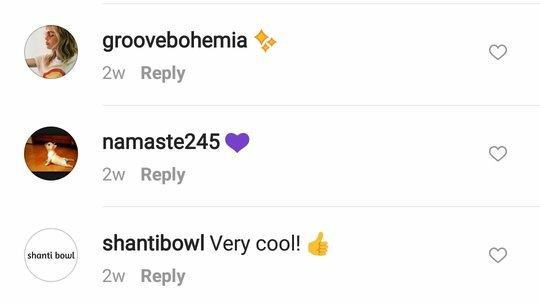 We’re sure you’ve seen Instagram comments that were clearly left by bots. You know, the generic “beautiful photo” comment on a picture of your broken iPhone. In this post, we’re going to go over the ins and outs of Instagram automation, show you the pitfalls to avoid and how to automate the right way. What Are Instagram Bots & What Do They Do? 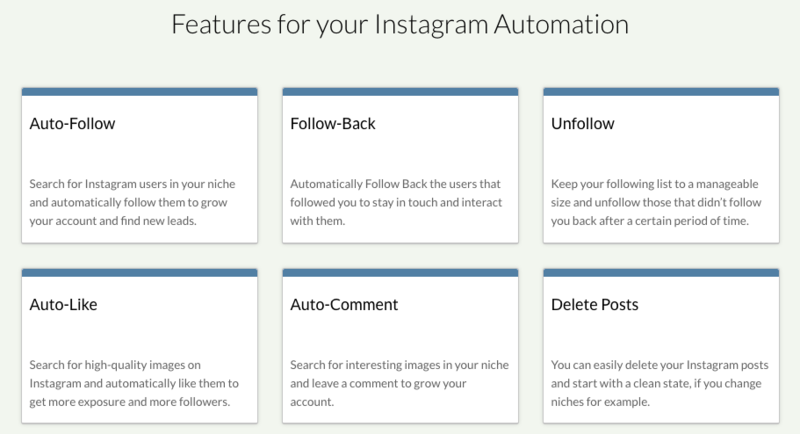 There are Instagram automation tools that perform all of these functions based on specific settings. For instance, you can have a bot leave comments on every post containing a certain hashtag. Or they could automatically follow anyone that follows one of your competitors. Instagram bots have a bad reputation because they often lead to extremely embarrassing moments. For instance, you could leave a comment on an inappropriate photo, or your comment could be completely irrelevant to the content. Since everything is handled by computers, you lose the human element that warns you it’s probably not a great idea to leave a comment that says “awesome” on a photo of a tragic event. We’d be lying if we told you Instagram automation and bots don’t have any benefits. Marketers are willing to risk getting their accounts banned to use automation, so there must be a reason behind it. Although we definitely don’t recommend doing it, it’s important to understand why Instagram automation is so popular. Manually scrolling through Instagram photos and videos to leave comments or likes takes time. Using bots to auto-like or mass follow/unfollow Instagram accounts can save you some time. As much as you’d probably like to spend eight hours a day interacting with users on Instagram, that’s not practical for most marketers. With Instagram automation tools, you’re able to set the actions you want the bots to perform and leave it running all day. 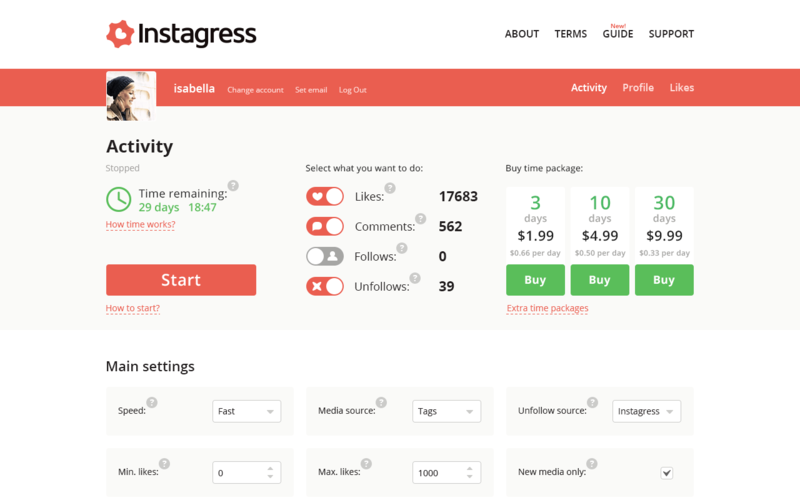 One of the most common reasons marketers use Instagram automation tools is for the auto-follow and unfollow features. This allows you to follow hundreds or thousands of accounts automatically with the hopes that a percentage of the accounts will follow you back. A big downside to this is you end up following a lot of accounts you’re not interested in, many of which may also be bots. You don’t know what posts you’re actually liking and commenting on. You can’t automate a conversation. So if someone replies to your automated comment, you need to reply manually. While these benefits might seem appealing, the reality is they’re not as beneficial as you might think. Often times the followers you attract will be bots or won’t actually engage with you. And real engagement is something that’s difficult to automate or replicate, so it’s often less effective than doing the work yourself. You must not access Instagram’s private API by means other than those permitted by Instagram. Don’t use an unreasonable amount of bandwidth, or adversely impact the stability of Instagram.com servers or the behavior of other apps using the Instagram APIs. The companies that make Instagram automation tools aren’t the only ones that have something to lose. Your brand is also at risk if you use them. When brands automate Instagram actions, their activity tends to become very unnatural. Instagram automation tools usually allow you to set a number of likes, comments and follows you want to do per hour or even per day. Do you think brands set these limits at a handful per hour? Of course not. You could do that manually within about 10 minutes a day. Instead, they use more aggressive settings to perform hundreds of likes and comments per day. However, eventually Instagram will cut you off. And in some cases, your account may even get banned. There aren’t any universal limits for Instagram as far as how many likes, comments and follows you can make a day. Instagram factors in things like your account age and activity. In order to keep your account active, it’s best to avoid automating likes, comments and follows altogether. Is Scheduling Instagram Posts Allowed? You might be wondering, is there anything you can automate on Instagram? The answer is yes, sort of. Scheduling Instagram posts is one of the areas where you have some leeway. 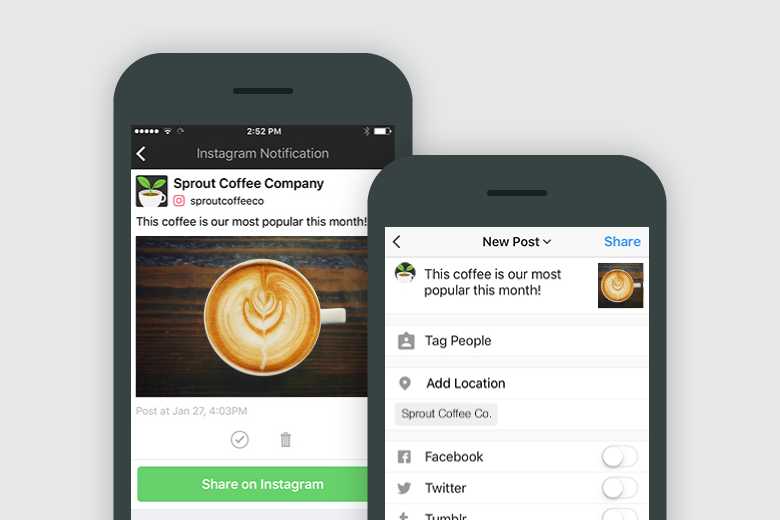 At Sprout Social, we provide Instagram scheduling as a part of our social media publishing tools. So why is scheduling allowed, but auto-liking, following and commenting aren’t? Instead, we allow you to upload your image in Sprout, write out your caption and then schedule the post to get sent to your phone where you can publish it manually. The process is very smooth, seamless and can be done in seconds. Here’s a video that shows exactly how it works. Scheduling Instagram posts in advanced is one of the only legitimate forms of Instagram automation that can save you time and help you work more efficiently. If you’re interested in testing it out for yourself, try Sprout free for 30 days and take it for a test drive. We live in the age of speed and quick results. That’s what makes Instagram automation so appealing in the first place. Getting hundreds of followers over night sounds a lot better than creating and implementing a full Instagram marketing strategy and slowly growing your following over several months. Quick results sound good on the surface, but the slow and steady approach will ultimately give you a more loyal and active following. Would you rather have 1,000 accounts following you just because you followed them first, or 500 people following you because they saw your content and felt compelled to follow you? You may not have the budget to hire someone to manage your Instagram account for you. In that case, you’ll have to work with your existing resources. Whether that means taking on more of the work yourself, or having your social media team dedicate more of their time specifically to Instagram, you’ll have to make it a priority if you want better results. It also helps to have an Instagram management tool like Sprout to schedule posts, monitor hashtags, get analytics and more. If saving time is the main reason you want to use Instagram automation tools, look for ways to optimize time spent on the stuff you’re doing manually. One switch you can make to get rid of your need for bots is to spend more time on engagement. You don’t have to publish 10 posts a day to be successful on Instagram. That means when you’re not creating or publishing content, your focus should be on interacting with other accounts. A bulk of your Instagram activity should be liking posts and leaving comments. If your comments stand out, people will be enticed enough to check out your profile and hopefully follow you. If you really want faster results, but don’t want to resort to spamming and using bots, Instagram Ads is a great option. Promoting your posts through Instagram Ads allows you to get in front of your target audience without having to leave hundreds of comments. 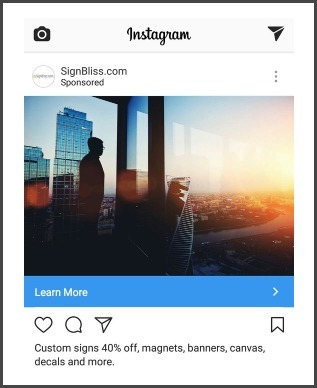 If you need help with your Instagram advertising efforts, check out these tips. Instagram automation is very popular and there are a lot of interesting reasons to do it. However, it has been shown time and time again that putting in the work is the best long-term strategy. Bots may save you some time at first, but the results aren’t always pretty. And of course, you could end up getting your account banned. We’re not sure about you, but it seems like an easy choice. Grow your account naturally through being creative, publishing great content and regularly engaging. It’s the only sure-fire approach to being successful on Instagram.